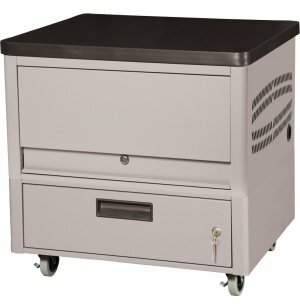 Image shown has 2" casters; this model has 5" casters. Transporting tablets is as easy as pushing a cart with Datum's Tablet Carts. These rolling cabinets glide effortlessly on 5" casters. They feature a locking drawer base and a laminate surface. Store, charge and secure tablets or e-readers of any size in Datum's Tablet Storage Depots. The convenient design of these high-gauge steel units enables students or professionals to enjoy worry-free protection throughout the day. Locking front doors and rear-access panels keep contents secure, while allowing easy access and interior configuration. These storage depots have individually-divided internal compartments which facilitate organization, making retrieval more efficient. When a higher storage capacity is necessary, multiple tablet storage depots can be placed side by side without any wire interference. They include built-in power strips for easy internal hookups. When storing enough tablets for an entire class, you may want to consider placing two or more units in different corners of your classroom, to avoid having all your students converge on one place at the same time. Smooth Rolling: These units include 5" casters which make it easier to push heavy loads and roll over thresholds between rooms. Extra Space: The locking drawer base supplies extra storage for accessories, manuals and more. 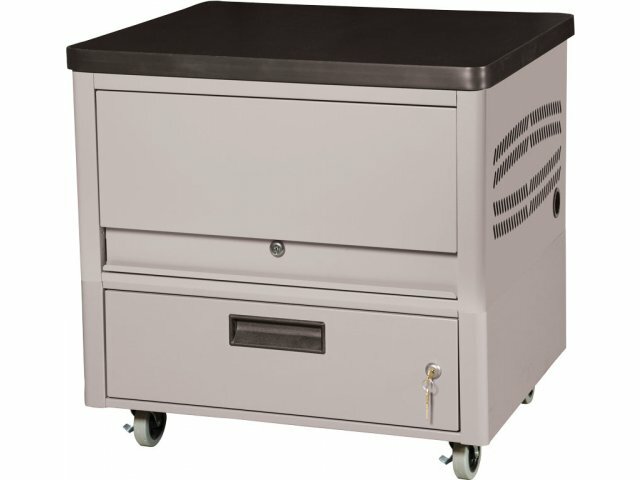 Versatile: A laminate top transforms carts into a convenient additional writing surface. User Friendly: Compartments inside the units are individually divided, making it easy to keep tablets organized and ready to go. Easy Plug-in: Built-in power strip enables units to charge internally. Secure Storage: Locking front doors and rear-access panels keep tablets protected throughout the day. Ventilated: Vented sides provide a steady airflow to the units inside. Configuration Options: Available as a stackable and mountable depot, or as a mobile cart. This product meets the standards set by the Canadian Standards Association.